Here’s a look at our 3 acre facility. 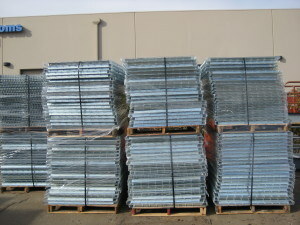 For 34 plus years Rossclark Material Handling has been providing quality new and used Warehouse products from its 3 acre facility in Rancho Cordova, California. As RCMH grew, we expanded our outreach to customers in Nevada, Oregon and Washington. Many of our customers are corporate accounts with over 70 locations in multiple states. We are proud to offer:Space Evaluations, Design Layouts, CAD drawings and Engineering. And,that’s just the beginning of our Project management process. We also offer services including Permit Processing for both Building Departments and Fire Departments with a 100% success rate for completion. Installation or de-installation are available for new warehouses or re-configuring your existing space. It all starts here at our 3 acre facility where we have a sales team of 9 professionals who have a philosophy that ‘Because of the Customer We Exist”. Your successful project is our goal.